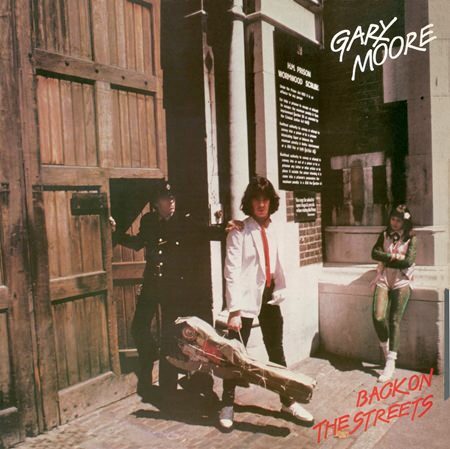 Gary Moore became a permanent member of Thin Lizzy last year. It’s his second run with them as he was a member six years ago as well, if only briefly. Since then he tried his luck with Skid Row and Colosseum II. His new solo album is a bouncy walk through muddy heavy rock, breakneck jazz rock(! ), electric blues and tender ballads. Phil Lynott is very much present both as bass player and singer – he even wrote three of the tracks. One of them, “Don’t Believe A Word”, is taken from Lizzy album “Johnny The Fox”. Moore transformes it into a slow, plaintive blues. The swirling “Hurricane” is a highlight, Moore attacks his guitar, shooting razor sharp notes faster than lightning. “Song For Donna” is a nice ditty, and then there’s Lynott’s sad beauty, “Parisienne Walkways” (with a wonderful, cascading guitar solo). A versatile album, chock full of guitars. Contents: Back on the Streets/Don’t Believe a Word/Fanatical Fascists/Flight of the Snow Moose/Hurricane/Song for Donna/What Would You Rather Bee or a Wasp/Parisienne Walkways. 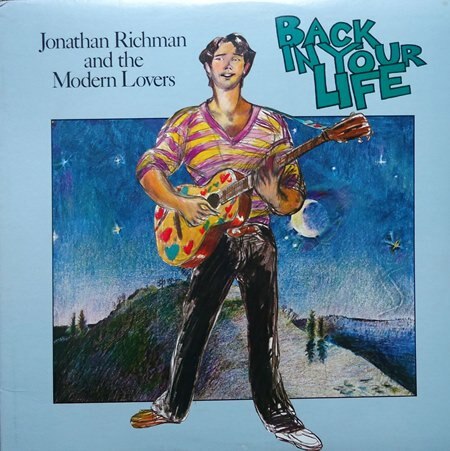 What a strange character he is, Jonathan Richman. A little boy lost in a grown up world. You either hate or love his wide-eyed and simplistic little songs. “Back In Your Life” is his fourth studio-album, and he stays in character. He smells the flowers, mimics bees buzzing and entrusts us that all people are good at heart. And as a bonus, we get the sad story of Abdul and his beloved Cleopatra. The combination of his rather flat voice with its charming off-key qualities, his shining eyes of wonder and his innocent and very childish smile is slightly disturbing. Is this man for real? And yet there he is, so in awe of the flowers, waiting for the ice cream man. His new album offers a mix of acoustic campfire-sing-a-longs, children’s songs and down in the basement rhythm & blues. The Modern Lovers are playing nice and easy, stripped down and simple. The jangly guitar solos are as wide-eyed as the songs, the rickety rhythm section almost, but not quite falling down the stairs, and the band’s harmony singing next to absurd as it highlights rather than camouflages Jonathan’s vocal shortcomings. “Back In Your Life” is kind, naive, warm hearted, simple and fun. And highly different. There is only one Jonathan. Recommended. Contents: Abdul And Cleopatra/(She’s Gonna) Respect Me/Lover Please/Affection/Buzz Buzz Buzz/Back In Your Life/ Party In The Woods Tonight/My Love Is A Flower (Just Beginning To Bloom)/I’m Nature’s Mosquito/Emaline/Lydia/I Hear You Calling Me.